A starched-stiff detachable wing collar from Luke Eyres. A detachable collar is a shirt collar separate from the shirt, fastened to it by studs. The collar is usually made of a different fabric from the shirt, in which case it is almost always white, and, being unattached to the shirt, can be specially starched to a hard cardboard-like consistency. Some believe that Hannah Montague invented this collar in Troy, New York, in 1827, after she snipped off the collar from one of her husband's shirts to wash it, and then sewed it back on. The Rev. Ebenezar Brown, a businessman in town, proceeded to commercialize it. The manufacture of detachable collars and the associated shirts became a significant industry in Troy. It was later that the benefit of being able to starch the collars became apparent, and for a short time, various other parts of the shirt, such as the front and cuffs, were also made detachable and treated to rigid stiffness. As more emphasis started to be placed on comfort in clothing this practice declined, and the stiff collar is the last surviving use of such heavily starched cotton in daywear; while a full dress shirt (worn with white tie and occasionally black tie) still has a stiff, but attached, front and cuffs to accompany the stiff detachable collar. The collar is attached to the shirt by a pair of studs like those shown. The shirt has a tunic collar, a short upright band of fabric with a hole at the back and one on each side at the front. The stiff collar is attached at the back before the shirt is donned (and the tie placed under the collar for a turndown collar), then the shirt is put on, after which the front stud is pushed through the collar to fasten it. 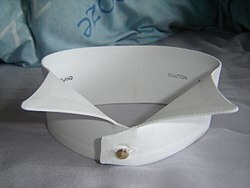 Detachable collars are often used by barristers in the UK, Ireland and Canada, many of whom wear a winged collar when in court to allow the use of bands. On the way to and from court, a turndown collar and tie is worn. Another common use of detachable collars now is a clerical collar (or "Roman Collar"), though these are now often made from flexible plastic for ease of washing, and are not always now attached in the traditional way with studs. Also, at Eton College, all pupils wear stiff collars, mostly turndown collars, while students in positions of authority wear 'stick-ups', which includes a wing collar. Outside these situations, detachable collars are less common. Stiff collars in particular with daywear in the 21st century are generally rare, but if one is worn, it is usually a turndown collar, though morning dress is seen still with a wing collar. Older styles, such as the imperial collar (a high collar with no wings last popular with the Edwardians), are not frequently seen now. A more common use of detachable collars is with eveningwear, in which case a high wing collar is worn in America although turn-down collars are preferred for black-tie in Britain as per Edward VII. To starch a collar, it must be rinsed in boiling water to remove any starch, then laundered as normal. After soaking in a concentrated warm starch solution, it is left until nearly dry, then ironed until hard. While ironing, the shape is added by curling, or using a collar press. ^ "Some notes on dress at Eton College". Archived from the original on 2008-10-11. Retrieved 2008-11-09.